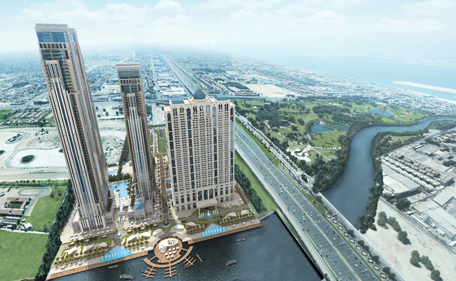 Dubai developers have commenced work on mega projects and are set to complete their developments much before 2020. The aim is to deliver their iconic projects (tourist attractions) ahead of Expo 2020, which will run from October 20, 2020 to April 10, 2021, and aims to draw more than 25 million visitors to the country. In April, Dubai government had said that the Expo 2020 master plan remains on track with a target date for completion of all major construction activities on site by October 2019, allowing for a full year of readiness testing across networks, systems and technologies. Dubai is expecting Dh25 billion in total investment in infrastructure-related projects in the run-up to Expo 2020 with nearly 277,000 new jobs being created. "We expect an acceleration in some iconic real estate projects as there will be a spurt in the overall demand from local and international investors. We foresee expectations increase dramatically across the entire spectrum of real estate,” Khalid Bin Kalban, CEO, Dubai Investments, had told this website. As billions of dirham worth of construction contracts are awarded, state-owned entities have announced plans to build more new iconic projects this year. Here are the details of projects under construction and announced this year. Work is in full swing on the Dh7.34-billion Dubai Water Canal that will connect the Business Bay with the Arabian Gulf passing through the heart of Dubai. Roads and Transport Authority (RTA) has already awarded contracts, worth Dh1.7bn, for the three phases of the project. The new contracts announced are for phase II and phase III, worth Dh1.1bn. China State Corporation has been awarded the Phase II contract, which comprises construction of bridges across the canal on Al Wasl and Jumeirah Roads at a cost of Dh384 million. Phase II will provide a link between Dubai Creek and the Arabian Gulf via a water canal passing across Sheikh Zayed Road, Al Safa Park, Jumeirah 2 and up to the Arabian Gulf near the southern part of the Jumeirah Creek Park. The work will completed be in the last quarter of 2016 to coincide with the completion of Phase I of the project covering the construction of a bridge on Sheikh Zayed Road passing over the course of the Canal, allowing free navigation around the clock. The phase 1 contract, valued at Dh580 million, was awarded to Turkish firms Mapa and Gunal. 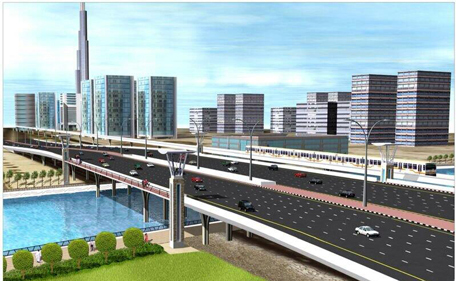 It includes the construction of a bridge on Sheikh Zayed Road, comprising eight lanes in each direction. 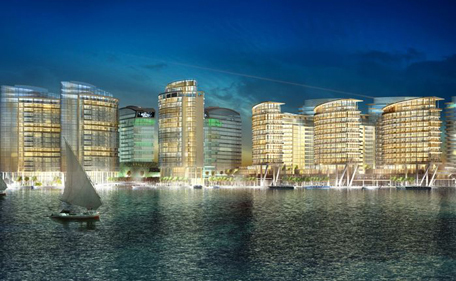 Belhasa Six Construct Company was awarded the phase III contract, worth Dh802m. 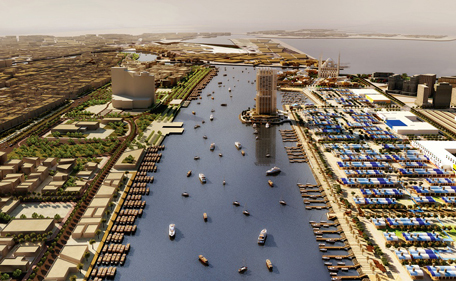 The phase III comprises construction of a water canal linking the Dubai creek with the Arabian Gulf. Work is set to start in June while the scheduled completed date is end-September 2016. 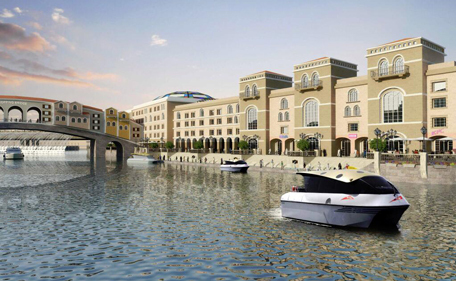 The Dubai Water Canal project will include a new shopping centre, four hotels and 450 restaurants as well as luxury housing and cycling paths. It is expected to provide new areas measuring 80,000 square metres for public places and facilities, as well as private marinas for boats and a new trade centre at the entrance of the canal. The canal itself will measure six meters deep, while bridges will be built eight meters high to allow the passing of yachts and marine craft. 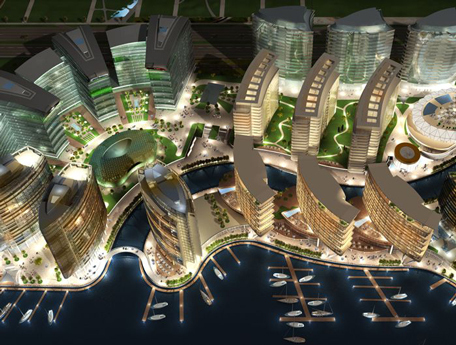 With Dubai International Real Estate, the developer of the Dh3bn Jewel of the Creek project in Port Saeed, having awarded the package 8 contract, worth Dh1.45 billion, to Habtoor Leighton Group (HLG), construction on the project will gather pace. HLG has worked on the project since 2012 when it was appointed to construct and complete the substructure works for four basement levels and ground floor slabs on the waterside site between Al Maktoum Bridge, Baniyas Road and the Floating Bridge. The scope of works for the new package involves construction and completion of five hospitality buildings, ranging between 15 and 19 floors, featuring a hotel and serviced apartments; a ballroom with an attached café; a marina including four foot bridges and one vehicular bridge; and hard and soft landscaping works. Construction works on package eight is scheduled to start Q3 2014 and complete in Q3 2017. Work on the Dh11bn Al Habtoor City, a residential and hospitality development, is progressing at a fast pace. 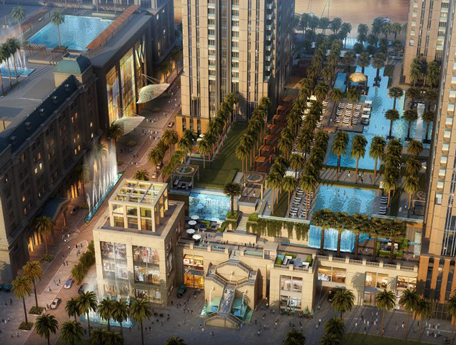 The City, according to Al Habtoor Group, the developer, will incorporate more than 3,000 hotel and residential units on one plot, three branded hotels and a permanent Franco Dragone Entertainment Group water-themed production. The three residential tower blocks will incorporate 1,460 luxury apartments, 11 penthouses, a tennis academy and club house with eight tennis courts including one covered air-conditioned court and a classical French-style landscaped garden. British architects WS Atkins are working on the residential blocks, while British architects John R & Partners and Khatib & Alami, an architecture firm from Middle East, are working on the hotel complex. The three hotels within the City consist of St. Regis, W Dubai Sheikh Zayed Road and Westin Dubai, Sheikh Zayed Road, with more than 1,600 keys between them. Starwood Hotels & Resorts Worldwide will operate them. Three renowned interior design consultants are involved in the hotel project: Hong Kong-based Bilkey Llinas (The St. Regis Dubai); Singapore-based Silverfox Studios (W Dubai – Sheikh Zayed Road) and London-based WA International (Westin Dubai – Sheikh Zayed Road). The developer, in an earlier statement, had said that the City and the Dubai Water Canal project are due to be completed at the same time. 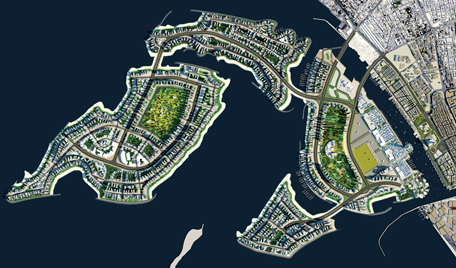 Deira Islands will see construction beginning soon as Nakheel is now seeking companies to design and build the stage 1 of Deira Islands, including up to nine beaches. The stage 1 includes placing and profiling of up to nine new beaches, construction of new coastal structures (breakwaters, revetments and quay walls) for two shore islands. The state-owned developer has already appointed AE7 for the design and supervision of the project, including master planning, parcelisation and infrastructure design, under a contract worth Dh28 million. AE7 was also awarded an architectural and engineering service contract worth Dh19.5m for the project’s Night market and Board Walk areas, two major attractions on the island. 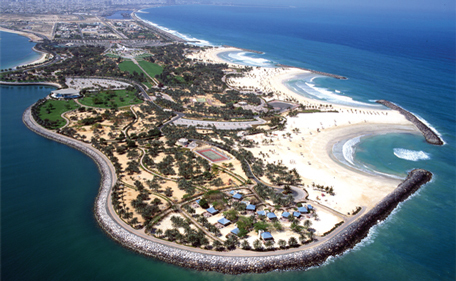 Announced during the Cityscape in October 2013, the 15.3 square kilometre Deira Islands comprises four islands, feature 21-kilometre beachfront and accommodate over 357,000 people when completed. 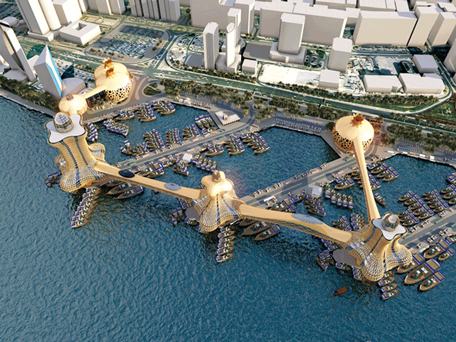 Deira Islands will include a shopping mall, 30,000-seater amphitheater and a marina that can accommodate large yachts. The development will be accessible from the mainland via road bridges and abras. 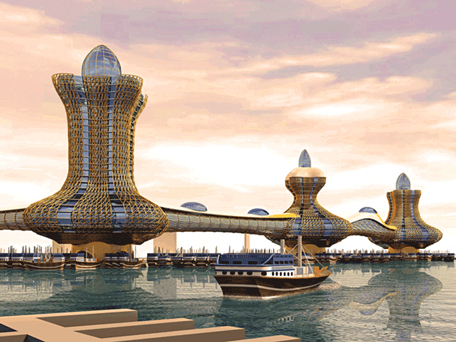 Dubai Municipality is planning to build an “Aladdin City,” a project inspired by the tales of Aladdin and Sindbad. The project will have three towers, comprising commercial and hotel space, with the towers spread over a distance of 450 meters on Dubai Creek. The project will also have air-conditioned bridges with moving floor to connect the towers, driveways and parking lots. The shape of the bridge, according to the Municipality, that will link the buildings represents the form of exotic marine life such as dragon and snakes. Three towers will have a built up area of 110,000 square meters with the highest tower of 34 storeys. The other two towers will have 26 and 25 floors respectively. There will be a total parking space for 900 cars. No details have been shared as to when will work commence and be completed. The latest project to join the list is the Al Mamzar beachfront lifestyle development with Emaar Properties and Dubai Municipality having already signed a memorandum of understanding (MoU) to develop the project. Emaar, a Dubai-listed developer, will conduct feasibility studies and submit a detailed project report outlining the development potential to Dubai Municipality. Following approval of the master plan, the two parties will finalise the project management structure. 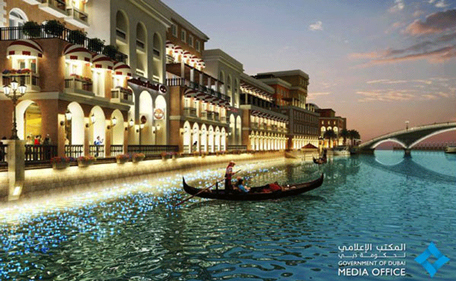 The project is being planned around the 53-hectare Al Mamzar Lake. Among the components being considered for the project are waterfront residences, serviced residences, retail amenities, fountains and water features, and water-themed leisure attractions.